In December 1963, Wanda Willard Smith became faculty secretary for Albert Outler at Perkins School of Theology, Southern Methodist University. Outler was just gearing up for his role as editor of the four volumes of John Wesley’s sermons in the Bicentennial Edition of Works. 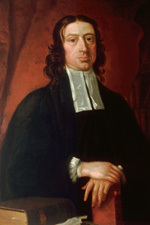 A few months into her new role, Outler suggested to Smith that it would be helpful for him to have a compilation of every time that Wesley preached, where we have record of his sermon text. She was happy to take on this task, though she soon discovered the breadth of what was involved. Over time she worked carefully through Wesley’s Journal (in Curnock’s edition), Telford’s eight volumes of Wesley’s Letters, Thomas Jackson’s fourteen volume edition of Wesley’s Works, and a variety of sources for other firsthand accounts of Wesley’s preaching. While a transcription of Wesley’s surviving diaries and one of his sermon registers was included in Curnock’s edition of the Journal, it became clear to Smith that she needed to double check these items in the original manuscripts. She gained indispensable help in this task when Richard Heitzenrater joined the faculty at Perkins, bringing his expertise in Wesley’s diaries and other manuscript materials. Smith continued to work on the sermon register project after Albert Outler’s retirement in 1980, directed by Heitzenrater. She completed a full copy shortly before her own retirement in 1993. Smith’s initial research predated the availability of personal computers. Thus, it was compiled on individual 5in. x 8in. research cards, which grew to nearly 23,000 in number. Toward the end Smith was able to compile this information into a single word-processing file. At the time it was thought that the sermon register might be published in hard copy as part of the Bicentennial edition of Wesley’s Works. So it has set for some time in this file. Recently it was decided that scholarly access to this important resource had been delayed long enough. Randy L. Maddox took on the task of converting the register to a format appropriate for online publication, editing it in current scholarly style, updating references to reflect the volumes that have appeared in the Bicentennial edition of Wesley’s Works, and adding new listings as discovered. He was assisted in this task by Jody Belcher, Elizabeth DeGaynor, and Bonnie Scott. Further details on the Purpose and Principles followed in this compilation are available here. The Register of John Wesley’s Preaching Texts is available in a searchable format here (pdf). A Locator Guide for preaching sites mentioned in the Register is available here (pdf). A list identifying the primary and secondary Sources cited in the Register is available here (pdf). A list of Abbreviations and Symbols used in the compilation is available here. Online Resources by the Wesley Works Editorial Project are licensed under a Creative Commons Attribution-NonCommercial-ShareAlike 3.0 United States License.